Ted Cline was born in Salisbury, North Carolina in 1938. He continues to reside there to this day. He and his wife Carolyn celebrated their 50th wedding anniversary in 2013. The couple has two daughters, Gail and Sally. Ted is a veteran of the U.S. Army and the National Guard. His work career has been in the retail business part of which was as co-owner of Palmer's Stationers. Ted joined ALPCA in 1973 and was co-host of the National Convention in 1981. He served as ALPCA Director from 1986-1987. He is a co-founder of the Carolina Collectors Club and served as secretary/treasurer for many years. 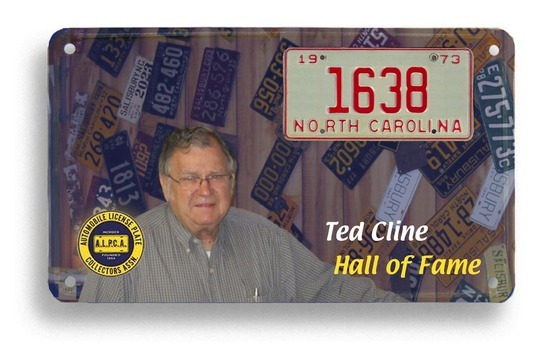 Ted has long been considered the most serious collector of North Carolina plates. He specialized in sample plates from all over North America. Kenny O'Dell says Ted "has nurtured many novice collectors into avid collectors and members by his enthusiasm and willingness to help." Kenny also notes that a visit to Ted is like a history lesson in plates and no one leaves without a few plate souvenirs as a reminder of their visit. Conrad Hughson labels Ted as a serious collector who left no stone unturned in building his collection and one of the most respected members in club history. Gerald Strickland says Ted's enthusiasm about the hobby is almost infectious. Richard Fawcett and Roger Haynes both said Ted was the first member to welcome them when they joined and helped direct their collecting interests. They are only a small sampling of those who call Ted an ambassador of plate collecting. The ALPCA Hall of Fame is proud to welcome Ted Cline to the ranks of members who have made a difference.